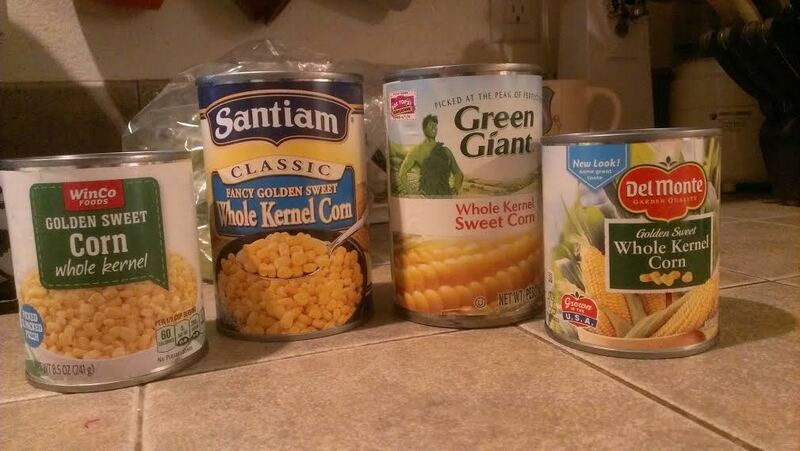 Canned Corn: Which Brand is Best? Tara and I were shopping for our weekly groceries this afternoon and were in the canned vegetables section. She needed canned corn for a goulash recipe she was making. “Normally I buy Green Giant,” she said. “But when I’m just mixing a bunch of ingredients together, the cheap stuff will do.” At that point she plucked a can of Santiam off the shelf and started to walk away. “I have no idea,” she replied. “We should find out,” I said. And just like that, a new food challenge was born! We can thank Napoleon Bonaparte for canning. French troops were suffering badly from malnutrition during their war with Russia in the 18th century, and Napoleon offered a reward of 12,000 francs to anybody who could develop a method of preserving food to keep the troops fed. Nicolas Appert, a candy maker from Paris, won the prize in 1809. Keenly aware that storing wine in sealed bottles helped preserve it, he applied the same principle to food, filling wide-mouthed glass bottles with food, corking them, and boiling them. The tin can followed shortly after, introduced by Englishman Peter Durand. And the rest is history. 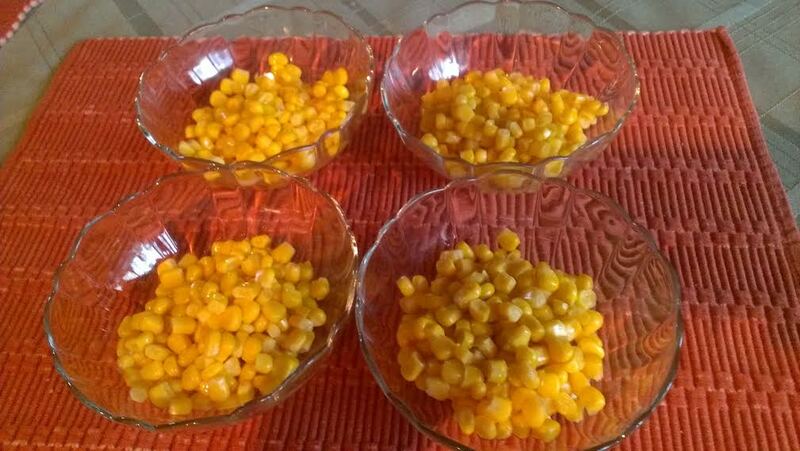 To keep the playing field even, I chose the same type of corn: sweet, whole kernel yellow corn. There were two “economy” brands, Santiam and the WinCo store brand, and two “premium” brands: Green Giant and Del Monte. We decided to sample them straight out of the can – uncooked and not doctored up with butter, salt, or any other flavoring that might inadvertently sway our opinions. It was a double-blind study in which I labeled the bottom of each bowl with a number from 1-4, each one matching with a corresponding can, and mixed them up so that I had no idea which bowl corresponded to which can. Tara and I enlisted the aid of my daughter, as well, for a third opinion. I went first, and it became immediately apparent that there were differences in flavor between each brand. They looked identical, but taste-wise, that was another story. After sampling all four, I chose my favorite. Then my daughter went, followed by Tara. Surprisingly, the results were unanimous. We all chose the same brand as our favorite. Del Monte’s kernels were plump and sweet, and had a pleasing consistency that was nearly creamy in texture. They were slightly salty, slightly buttery. Just a good, crisp fresh-tasting corn. Green Giant came in second. Again, the corn was high quality, but the flavor was just a little lacking. We were split between the bottom two as to which was worse, but they both finished 3 and 4 in the rankings. I found the WinCo brand to have a strange “burned” flavor, while Tara described it as tasting metallic. The Santiam brand didn’t have much flavor at all, and the kernels were a little smaller – and stringier. I have to admit, the results of this taste test surprised me. I had always assumed all canned vegetables were the same, and that if you bought a more expensive brand you were essentially paying for the name. It turns out I was wrong, that there are differences in quality. The lesson? You get what you pay for! From now on, we’ll be buying Del Monte when we purchase canned corn. I’m curious to see how other canned veggies stack up. Look for a sequel coming soon. In the meantime, here are 15 great recipes using canned corn. When it comes to canned corn, you get what you pay for.